In 1711 Parliament passed the New Churches in London and Westminster Act 1710, with the purpose of building fifty new churches for the rapidly growing conurbation of London. It did not achieve its target, but did build a number of churches which would become known as the Queen Anne Churches. Upon the completion of St George’s, the church could boast G.F. Handel as one of its parishioners. The church was such a fashionable place to marry that a Victorian writer referred to the church as The London Temple of Hymen. 1816 was a record year with 1,063 weddings, including 9 on Christmas Day. It was here that future US President Theodore Roosevelt was married in 1886. From an adaptation of George Bernard Shaw’s Pygmalion—My Fair Lady—comes the song about St George’s Get Me to the Church on Time. 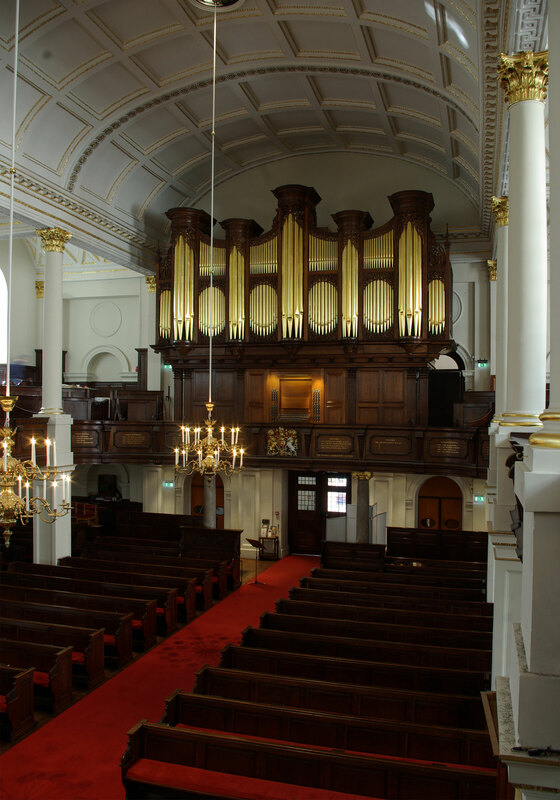 Gerald Smith, nephew of the builder of St Paul’s Cathedral organ, Bernard Smith, built the first organ in 1725. The original casework (the central portion) contained 1514 pipes on three manuals. In 1761 John Snetzler became the first in a series of builders to build a new organ in the old case. Sir Arthur Blomfield added the side extensions to the case in the late 19th century. Hope Jones built a new organ in 1894 and then again in 1896 after sustaining severe damage from fire. Ian Bell, advisor for the church, contacted us in 2008 to propose an entirely new organ in the historic case. After a subsequent visit to our organs by Simon Williams, Organist and Director of Music, and the Rector, Revd Roddy Leece, the parish commissioned us to build a new organ. This instrument is a departure for us on several accounts: our first organ abroad, our first organ to fit in an existing case, the first to emphasize the role of a Choir division in place of a Positive, and consequently, our first organ with 2 independent swell boxes. This organ also builds on our recent trends to add more variety of color and volume to the stoplist. The result of this new direction is an organ that continues our North European inspirations for color, clarity, and gravitas, while subtly shifting the emphasis towards the needs of the Anglican choir. 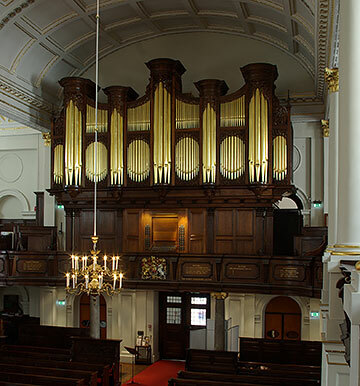 We are honored to be building an organ for St George’s, Hanover Square and the first American built organ for a London church.